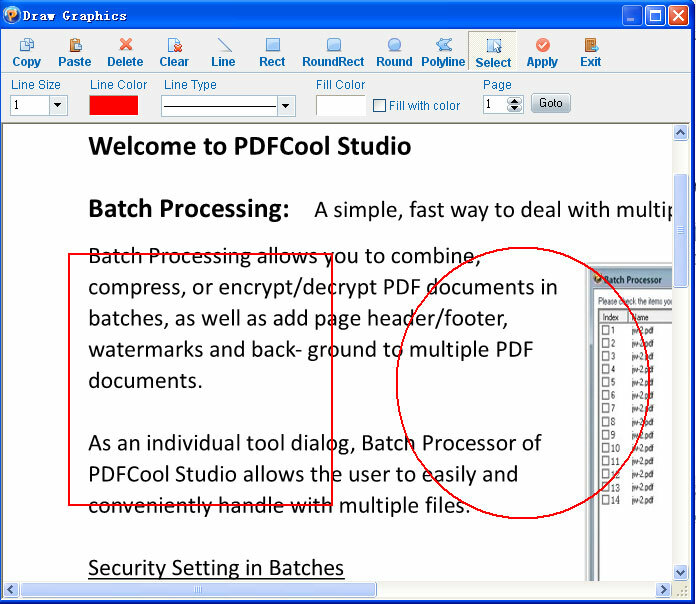 "Draw Graphics" tool allows you to draw vector graphics on PDF pages conveniently. It can be used to draw commonly used Line, Rect, Round and Polyline etc. Access to the "Draw Graphics" tool main interface, you can go to the top menu bar and choose "Tools > Draw Graphics". You can find various kinds of tool buttons on the top tool bar in this dialog, such as Copy, Paste, Delete, Clear, Line, Rect, RoundRext, Polyline etc. Below which are their relevant properties, such as Line Color, Type and Fill Color etc. With these, you can adjust the property easily to draw various kinds of graphics. Select: Click on the Select button or double-click in editable area, the program will switch from drawing mode to selection mode. In the selection mode, you can click to choose the graphics, and then stretch, copy or delete. Apply: Apply all the drawing actions to PDF document and then exit this Draw Graphics tool. Copy: Copy the selected item. Past: Paste the copied item to the present position. Clear: Clear all the drawed graphics before. Exit: Exit "Draw Graphics" tool.